Spring has well and truly sprung, so the thoughts of cruise fanatics turn inevitably to where they are going to head to on their next trip. Luckily, the latest issue of World of Cruising is packed full of inspiration. 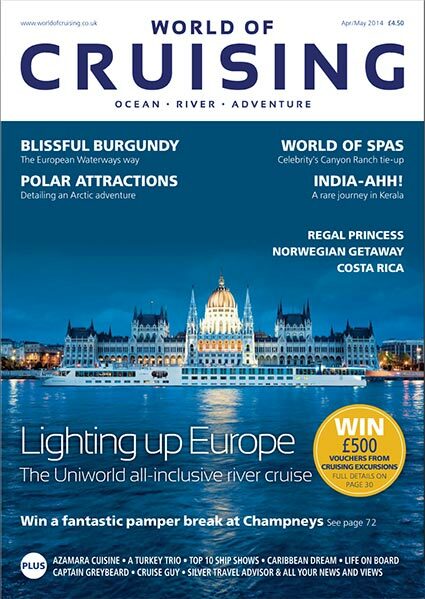 Our cover story lifts the lid on Uniworld, one of the best kept secrets in the world of river cruising – available through Titan in the UK. Then we’re off following in the footsteps of the Prince of Wales and Duchess of Cornwall no less to the exotic Indian region of Kerala, on board the exclusive Oberoi Vrinda. There are reports from Miami where Norwegian Cruise Line’s Norwegian Getaway will be based for Caribbean jaunts. Gary Buchanan enjoys life in the slow lane aboard a European Waterways hotel barge. Meanwhile our adventure specialist Steve Newman rounds up the latest Arctic cruises for those who are looking for the experience of a lifetime. And there’s much more. We count down to the launch of the Regal Princess with our New Ship Review, take a look at the top 10 big-ship stage shows that you won’t want to miss, and sample Azamara’s amazing cuisine. On top of our usual in-depth reports and reviews, you can enjoy our essential World of Spas section, and columnists like Captain Greybeard, Cruise Radio and Cruise Guy to go with newcomers like Andy Harmer (the director of CLIA, the voice of the cruise industry in the UK) and cruise consultants Silver Travel Advisor. So what are you waiting for? Stop wishing and start planning your next trip.